One of the exciting new possibilites in Windows Azure Infrastructure as a Service (IaaS) is the ability to create Virtual Machine images (VHD files) locally and upload them to your own image store in Windows Azure, and use them as the basis for new VMs. In this article I will demonstrate the process of uploading such an image and creating a virtual machine from it in Windows Azure. There are many Cloud Storage explorers out there that can connect to Windows Azure blog storage to upload files. In this case I will use CSUpload.exe from Microsoft which is part of the Windows Azure SDK. It looks to have the best security and is specifically designed to upload images to Windows Azure. After you have installed the Windows Azure SDK the easiest way to locate CSUpload is to start the Windows Azure Command Prompt and change to the bin directory. OS Images: These are generalized, read-only, base disks used for creating new virtual machines. They are either provided by Microsoft, third parties or you. OS Disks: These are specialized, dedicated, writable disks that serve as the OS disk for a specific machine. If you have migrated a VM from your local virtualiztion platform to run it unmodified in Windows Azure you will use this kind of disk. Max size for an OS disk is 127 GB. Data Disks: Writable disks that do not contain an operating system. They can either be migrated from your local network or created from Windows Azure. Max size for a data disk is 1 TB. The VM size determines how many data disks you can attach. CSUpload can upload virtual disks with either the VHD or AVHD extension, meaning you can upload both parent (VHD) and child (AVHD) disks. Updated the default connection string. Once you have configured this, CSUpload will remember it until you do something to change your subscription, say delete your management certificate etc. You could also specify these parameters each time you run one of the other CSUpload commands, but that gets old real quick. Better to define them once. Destination: the storage account and path where the disk will be stored in Windows Azure. 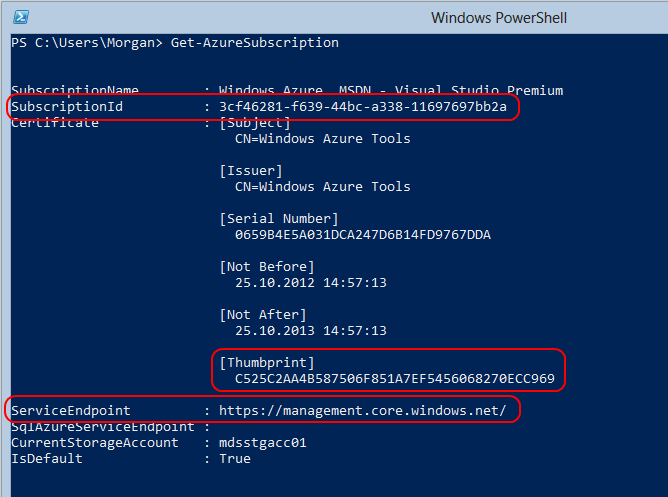 This is consists of two parts; the URL of the storage account, which you can get either from the portal or the cmdlet Get-AzureStorageAccount, the path where you want to put the VHD in that storage account, and the name of the VHD, including the .vhd extension. Label: The disk’s label, which is displayed when you create new VMs in Windows Azure. LiteralPath: The location of the VHD/AVHD file to upload, this is on your local disk. OS: If the disk contains an operating system, specify either Windows or Linux. MD5 hash is being calculated for the file ‘d:Hyper-VVirtual Hard Disksbase_win7sp1x64.vhd’. Registering the image ‘basewin7sp1x64.vhd’ with repository. Image ‘basewin7sp1x64.vhd’ is registered successfully. CSUpload starts by generating an MD5 hash of your file to gurantee that it has been transferred correctly.CSUpload will report its progress as a percentage and display the speed at which it reads data from you local disk. This number is given in Mbps. No actual transfer of data has started yet. Once the MD5 calculation is finished CSUpload will allocate a blob of the same size as the disk in your storage account. Now CSUpload will transfer the contents of the disk to Windows Azure. Note that only blocks in the VHD that actually contain data will be transferred, empty blocks are skipped. If you have a large disk you will see CSUpload use some time maping which blocks contain data. We are using the CSUpload command Add-PersistentVMImage, which means we are uploading something that can be the basis of new VMs in Windows Azure IaaS. We need to tell Widnows Azure that it is dealing with an image so CSUpload will register the image in your subscriptions image repository. This means it will be visible both under Images in the Virtual Machine node and in your blob storage account. Image in the image repository. Image in the storage account. 0000 bytes. The size must be a whole number (in MBs). For you so successfully connect to a new VM based on your image, any image you upload must have Remote Desktop enabled and allowed through the host based firewall. The local Administrator account must be enabled and must have a password set. Later versions of Windows do not allow logon through Remote Desktop with a blank password. You should use HTTPS when specifying you blob storage. HTTP could leak data during transfer, which CSUpload will warn you about:Use of http is insecure, can leak data to untrusted viewers and make your content vulnerable to data tampering by a malicious third party. Windows Azure Architecture Guides released! A 9 MB Word-document; you gotta love it! Which accounts can I assign as Windows Azure co-administrators? Recently the ability to add co-administrators to you Windows Azure portal was migrated from the old Silverlight portal to the new HTML 5 portal. Happy times! 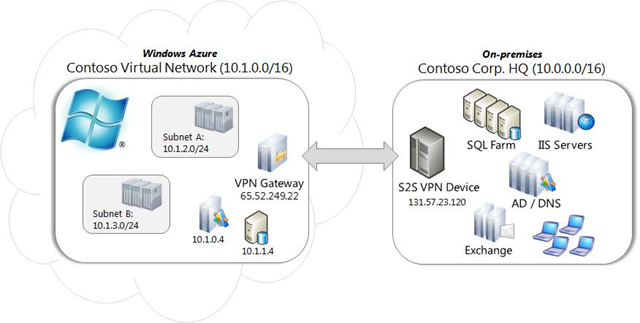 Together with the launch of Windows Azure Infrastructure as a Service (IaaS) this summer, Microsoft also introduced a way for customers to connect their on-premise networks with Windows Azure using site-to-site VPN. Fortunately for us Windows Server 2008 R2 supports all of these! So let’s set it up. These will host you Windows Azure VMs and be your LANs in Windows Azure. Configure this network with all the subnets that you run in your on-premise network, as well as the public IP address of you VPN device. These can be any DNS server; on-premise, in Windows Azure and public DNS. All the servers you add will be assigned with Windows Azure DHCP to your VMs. This network represents the link between you and Windows Azure. It must be within the boundary of the networks you created in Windows Azure in the previous step. The VPN device cannot be behind a NAT, not even a 1:1 NAT with public IPs. After completing the setup in Windows Azure you are ready to configure your local device. Our task here is to connect our on-premise network with our Windows Azure networks and then promote a server in Windows Azure to a domain controller for our Active Directory domain. Your local VPN server does not need to be the default gateway for your local network, but if it is, it will make your setup easier. Suffice it to say that you need to work out the routing requirements in your environment. In this example I assume that the VPN server is also your local default gateway. Your VPN server should not have a default gateway IP set on the NIC connected to the local network (LAN). If you require custom routing use RRAS, the route command or NETSH to set up your routes. Your local Windows Server machine needs at least two NICs, one connected to your local network and one to the public Internet. The server does not need to be joined to your domain. I highly recomment you keep the Windows Firewall enabled on the VPN server. Having a server directly connected to the Internet without a firewall is not a good idea. 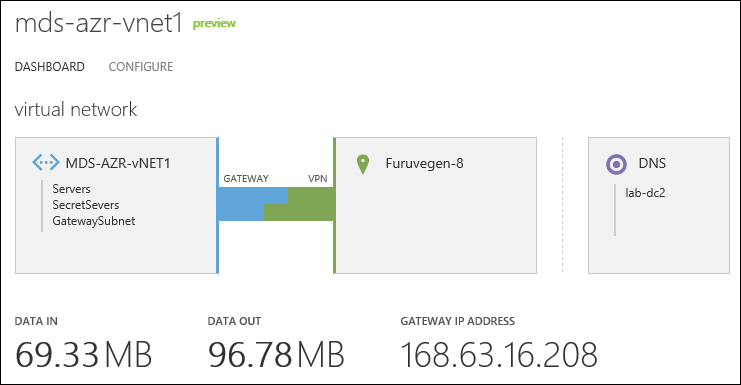 Document the public IP of your VPN server and the public IP of your Windows Azure Gateway endpoint, as well as your Windows Azure networks and local networks. You will need these during setup. 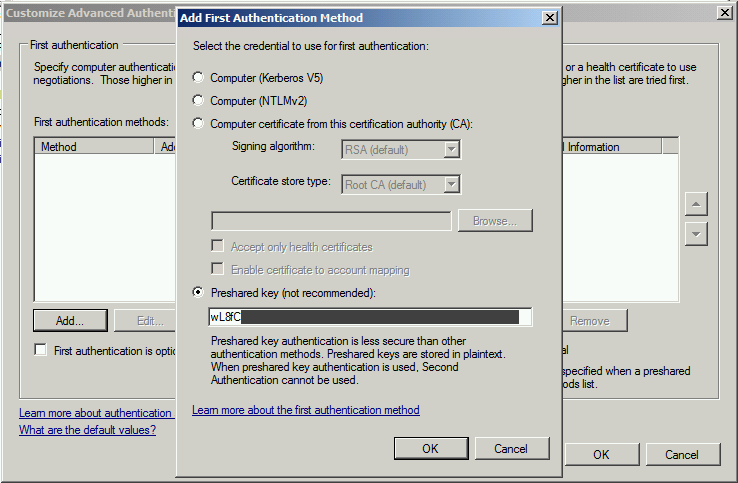 Find you IPSec encryption key from the Windows Azure portal. 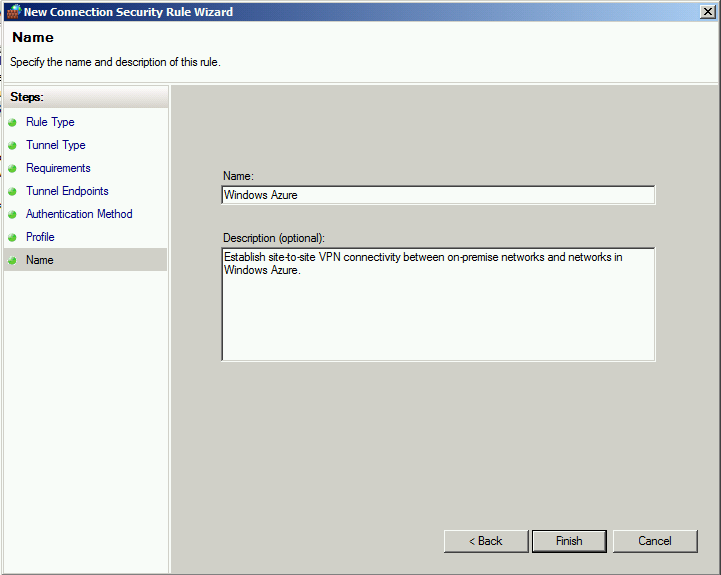 Add VM in Windows Azure and promote to domain controller. Install the Routing and Remote Access (RRAS) Role Service which is part of the Network Policy Server and Access Services role. 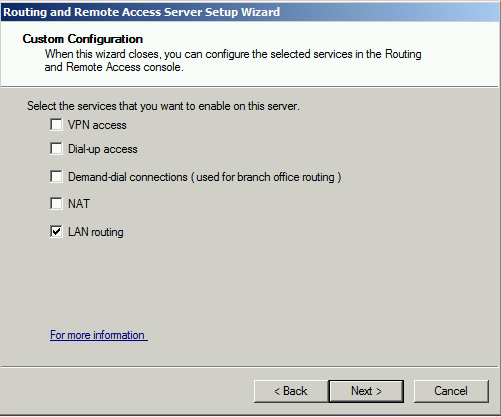 You will need to select both Remote Access Service and Routing, one cannot be installed without the other. You can do this either through Server Manager or PowerShell. What this step does is turn Windows into an IPv4/IPv6 router. It simply tells it to start forwarding IP datagrams. Unless you have special routing requirements in your environment you are finished with configuring RRAS. 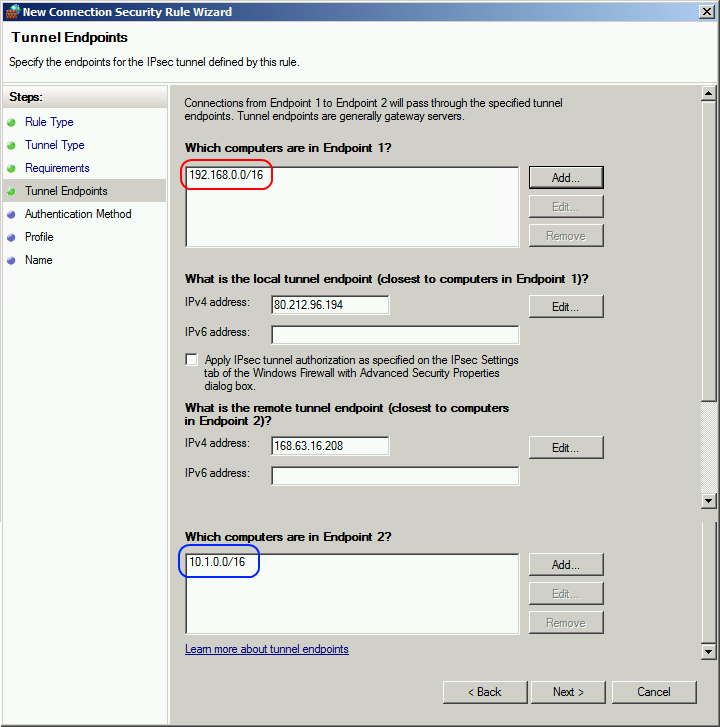 In Windows Server 2008 and newer IPSec settings have been merged into the Windows Firewall. NOTE: It is extremely important that the networks you define here match your local network configuration in Windows Azure or your traffic will not be routed. Run the first NETSH command again to verify the change. 11. 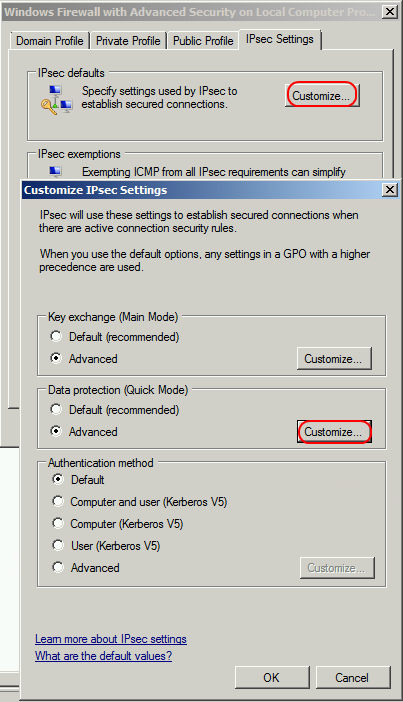 Configure the IPSec Quick Mode key lifetimes. Windows Azure Gateway uses a Quick Mode (Phase 2) key lifetime of 1 hour (3600 seconds) or 100 GB of traffic, whichever happens first. The Phase 1 key lifetime is 8 hours, which is the default in Windows Server 2008 R2 so there is no need to change that. Under Key lifetimes the timeout value in minutes is already set correctly to 60 minutes (3600 seconds) so we only need to configure the KB timeout. Set it to 102 400 000 KB (100 GB). Exit out of all the boxes by pressing OK. NOTE: These are global settings which affect all connection security rules on the server. 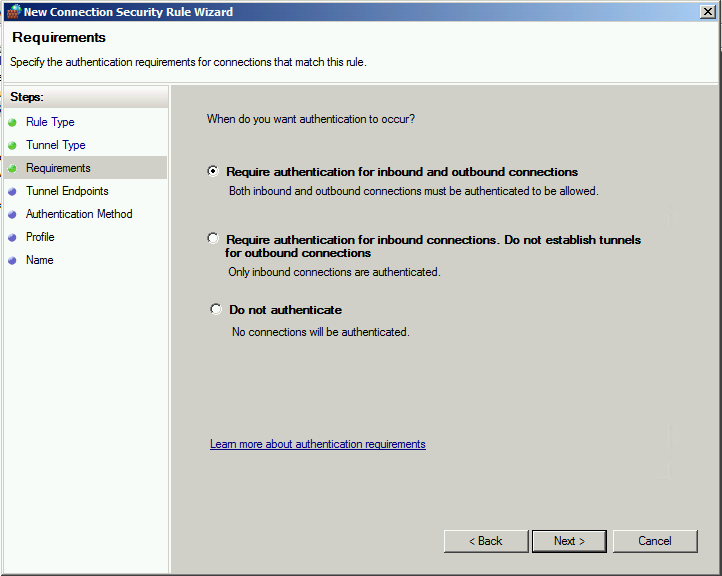 If you want to specify these settings only on the connection security rule that pertains to Windows Azure, use NETSH. Unfortunately you cannot configur connection security rules specific main mode or quick mode settings in the GUI. Also you cannot use NETSH to configure global quick mode settings, only main mode settings. The logic behind this escapes me…. If you do decide to configure rule specific quick mode settings with NETSH, the GUI will inform you that your rule “…contains properties that are not supported through this interface”. That said I would actually recommend using rule specific quick mode settings because that way you won’t have to change the computer defaults which could potentially cause problems for other rules. Although not needed by Windows Azure Gateway, because the default settings match the required settings, you can also configure specific main mode rules that match e.g. endpoints, using NETSH. More about the diffrences between the Advanced Firewall GUI and NETSH here. Also have a look at the scripts section at the end of the post. 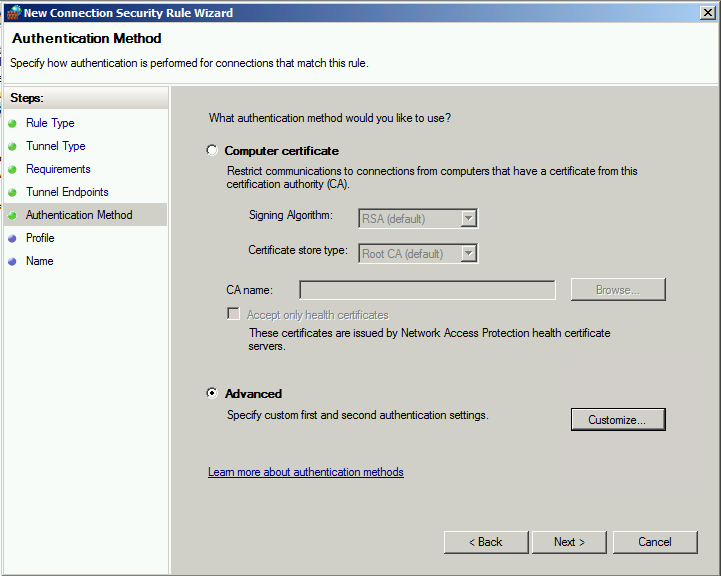 If you do not see any security associations, try to ping an address in one of your Windows Azure networks. This should establish the tunnel. Now you can add Windows Azure VMs to your Windows Azure networks. These machines will receive IP addresses from the Windows Azure DHCP service. The addresses will be leased to the machine for its lifetime so it will be the same as having a static IP. 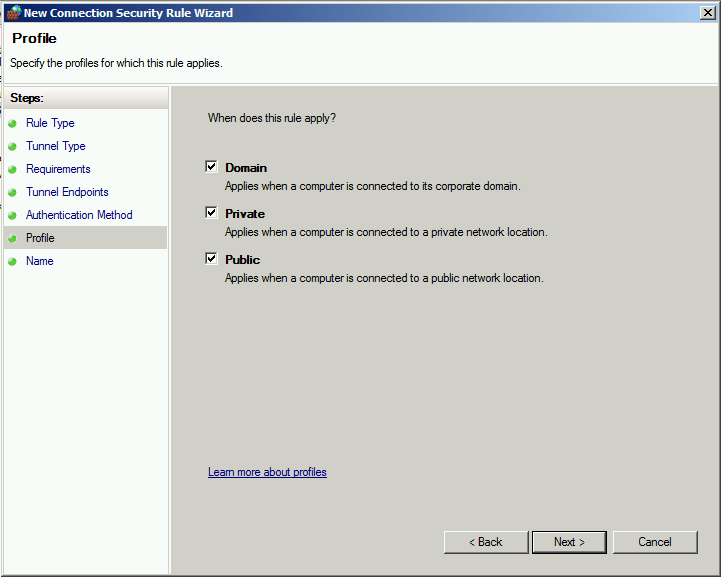 Windows Azure DHCP will also configure the servers with the DNS servers you have defined in Windows Azure. These can be both on premise and in the cloud. The default gateways for the machines will be set to the first address on the subet that the machine is connected to. So if you combine all the commands in a nice cmd file you have something resembling a router configuration script. IPv6 is currently not supported by Windows Azure so you will have no IPv6 native connectivity. Maybe you can make some of the transition technologies work. I have not tested that. 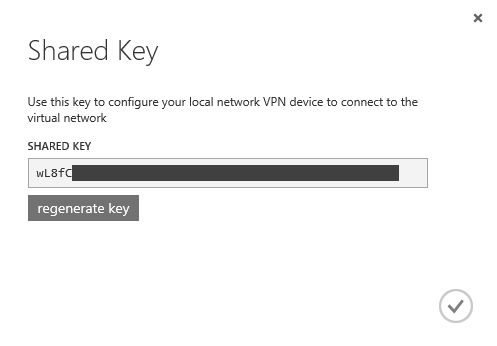 The VPN Server itself will not be able to communicate with virtual machines in Windows Azure. Only computers behind the VPN server will have communication. I was able to measure a transfer speed of about 9 Mbps between my local network and a Small Instance VM running in Windows Azure. 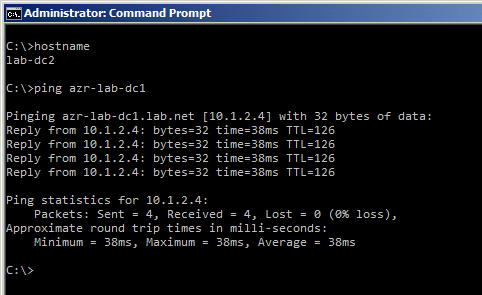 I used IPERF to test. I have experienced some instability with this solutions but I am not sure if this has to do with Windows Server or Windows Azure. Leave a comment with your experiences. The Windows Firewall protects your VPN Server on the Internet. make sure that it is configured correctly. May I also suggest to remove any unnecessary bindings on the Internet facing NIC. Also remember that the VPN traffic is not inspected by the firewall since it is inside the tunnel. The configuration scripts available for supported gateway devices, currently Cisco and Juniper, are quite useful to understand the settings needed to configure your VPN server. These are available for download through the Windows Azure Managmenet Portal, under Networks. Windows Azure PowerShell can also be used to manage and set up your networks and gateway. Windows Azure Training Kit October Refresh released! In this hands-on lab you will learn how to deploy a simple ASP.NET MVC3 Web application to a Web server hosted in Windows Azure, using SQL Server and configuring load balancing. 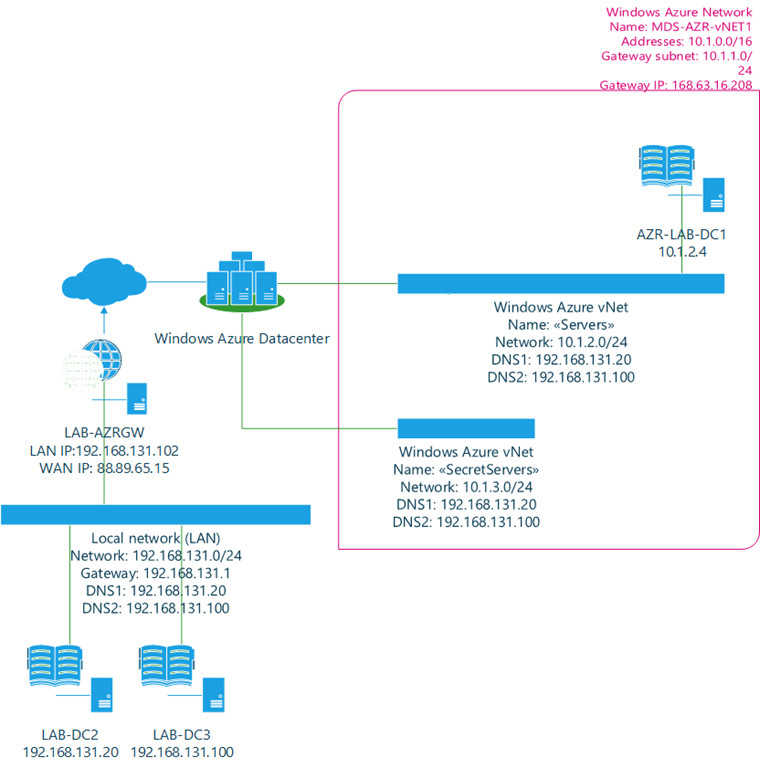 In this Hands-on lab you will walk through the steps necessary to deploy a stand-alone domain in the cloud using Windows Azure Virtual Machines and Virtual Networks using PowerShell. Introduction to using the Windows Azure PowerShell Cmdlets to manage and automate virtual machines and virtual networks. In this hands-on lab you will understand the capabilities of automating the deployment and management of virtual machines in Windows Azure.